By announcing possible direct weapons supplies to the Syrian rebels, the US is trying to build a case to suit their pre-existing notions and stance, according to geopolitical analyst Patrick Henningsen. For two years, the US government tried to publicly shy away from direct contact with radicals in Syria. Staunch advocates of peace, they did not want anything to do directly with weapons supplies to rebel forces. But in the light of concrete accusations of alleged chemical weapons use by the Syrian government, some fear the US will no longer hold back, instead taking a more direct role in the dismantling of the Assad regime. 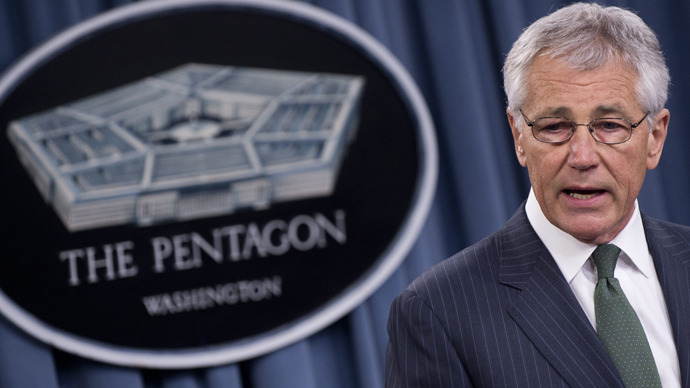 US Defense Secretary Chuck Hagel has announced that the country may finally push for a more direct involvement in the Syrian crisis. Geopolitical analyst Patrick Henningsen spoke to RT, expressing disbelief at the recent announcement and underlining the kind of strategies and power plays the West will now use to make their partnership with the Syrian rebels more official – as opposed to hushed and indirect, which he alleges has been happening all along. RT:President Obama talked about options and now his defense secretary is doing the same. Does Washington mean business in this case or is this just rhetoric? Patrick Henningsen: What they’re trying to do here is re-write the legal language that defines chemical weapons. You can see already in the US the government’s official position is that a pressure cooker constitutes a weapon of mass destruction. So that’s one side – the legal side. And the other side is called ‘political nudging’…so they’re nudging their way into Syria via different pathways. And of course they’re trying to nudge Russia out of the way in the process. RT:How much is this in danger of being a mission creep? Do you think the US could be stuck in a potentially explosive civil conflict in an unstable place? PH: A lot of this is public relations theatre. Unofficially the US, Britain and NATO have been airlifting quite a lot of weapons into Jordan via Croatia and other places, through turkey – another NATO country. So what they’re trying to do is make their position official rather than unofficial. This is aside from the fact that they have full support for the Saudis and the Qataris who are sending arms there as we speak. But they’re saying the weapons they’ve requested are surface-air missiles, anti-tank, depleted uranium munitions… this is kind of a ridiculous scenario where the rebels have this sort of wish list of arms they’d like to get and the US is hammering the UN to get them to try to do this ‘ legally’, quote unquote. But of course ‘legally’ is a very relative term, if you look at the history of the United States and Britain getting intervention green-lights in the last 10-15 years. RT:The rebels have long been able to purchase weapons. What would be the impact if simply the US weapons were able to go there? PH: What it’s going to do is making instead of an under-the-table operation a public operation. Of course one of the things it’s going to do as well is allow for Israel’s position on Syria to be formalized. Israel is very interested in taking a piece of Syria – the Golan Heights area. I said this on your program over a year ago and some people thought it was crazy, but that’s what the agenda is and you can see Israel moving in that direction already. So there’s a lot of different factors at play surrounding Syria right now and you’ve got Lebanon off to the side as well and the issue of Hezbollah, which Israel would like to eliminate on Lebanon. So there are all contributing to the interesting and not so nice mix we have going on with intervention in Syria. RT:Hegel’s statement came on the same day as the opposition reported what they call a massacre by government troops. What do you read into the timing of these two announcements? PH: One of the problems with reports of massacres is that the sole source of most of these statistics and reports is the Syrian Observatory for Human Rights based in London. And already their numbers and their reports have been proven to be fabricated, false and distorted. So this is the sole basis of intervention in Syria. This plus reports of uses of chemical weapons – but not real chemical weapons. So, we have a major problem: we’re basing the whole premise of intervention on stuff a lot of which is fiction. They’re trying to build their case to suit their already pre-existing conclusions. It’s a failure of politics, a failure of diplomacy. And it’s also a failure of logic, quite frankly.